This is the second part of The Year 2000 page. On November 18, 1999, the 2000 page became over-maxed with material. This made it neccessary to split the page into two pages. All base 7 datings provided on this page, the 2000 Part One page, the 1999 page, and the Early 21st Century pages were calculated between October 5, 1997 and January 5, 1999 unless otherwise specified. I have designated all forecasts made after January 5, 1999, as NEW PREDICTION followed by the add date. At this time, most of my predictions, interpretations, and views expressed in the almanacs were formulated between April 1992 and January 1999. Some opinions can be traced back as far as May 1988. Prediction: BLACK US ACTRESS WILL COMMIT SUICIDE LIKE DOROTHY DANDRIDGE. Date projected to occur: September 2000. Actress Halle Berry today has admitted to attempting suicide by asphyxiation in 2000. Halle Berry came close to suicide - March 21, 2002. Prediction: RUSSIAN OR US INVASION OF AFGHANISTAN - FULFILLED. Date projected to occur: December 2000. U.S., Britain bomb Afghanistan - October 7, 2001. US renews assault on Taleban - October 9, 2001. APRIL 17, 2001 -- FOUR STATES PREPARE AS MISSISSIPPI APPROACHES RECORD LEVELS -- ST. PAUL, Minnesota (CNN) -- As the Mississippi River nears record levels, officials say the length of time it stays high could be critical in how much flood damage results. The river is expected to crest south of St. Paul perhaps as early as Wednesday and stay at that level through Friday, said Kevin Smith, director of communications for the Minnesota Department of Public Safety. A crest lasting that long will strain dikes and levees, he said. "If they can't hold, we've got trouble." Smith said residents and officials are just waiting for nature to take its course. "Everybody seems to be as ready as possible," he said. There are no major evacuations of cities or towns, he said, but residents of some individual homes in vulnerable areas were asked to leave. The situation is similar along the Mississippi south into Illinois and Iowa. Flooding has spread river water over low-lying fields, but so far higher areas and population centers protected by dikes and levees are remaining relatively dry. On Abel-Essman Island, just north of Guttenberg, Iowa, about 200 of the island's 300 residents have left in anticipation of flooding this weekend, resident Richard Burroughs told CNN. 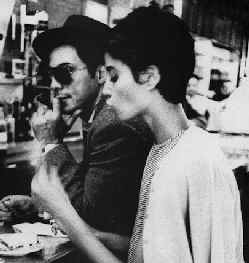 However, Burroughs, his wife and others plan to stay. More than 100 miles down river, in Davenport, Iowa, Mayor Phil Yerington said his city expects a crest not quite as high as the one in 1993, when water hit its highest level in the past 35 years. Since that flood, he said, the city has built more dams and levees and added pumps. The National Weather Service said Tuesday that the river will crest about half a foot lower than previously expected along the Wisconsin-Minnesota border. It said the prediction was lowered because flows into the river from the Chippewa and St. Croix rivers are lower than expected. The lower prediction means the river would crest about a foot-and-a-half below the 18-foot design limit of the dike system that La Crosse, Wisconsin, built after a record river level of 17.9 feet in 1965. Still, the current river levels are historically high. "It could be the second-worst flooding ever for La Crosse," said Wisconsin Emergency Management spokeswoman Lori Getter in Madison. "Hopefully we'll get through this. The crest should last about 36 hours. Wisconsin Gov. Scott McCallum has been keeping close tabs on the situation. "We're looking at the next 24 hours having the first peak of waters, the first crest, and now the forecast appears for thunderstorms later in the week so we may now have another crest over the weekend," McCallum said. McCallum declared a state of emergency in nine southwestern Wisconsin counties Monday, freeing additional state resources to help with flood relief efforts. Flooding has already been extensive. The river is two to three miles wide in some areas, said La Crosse County Emergency management coordinator Al Spaulding, but most of the flooding has been in lightly populated areas, so far. NEW PREDICTION: 9/7/99 --Between June and August 2000, the United States will experience its worst flooding to date. The central US and possibly portions of the east coast will see drainage ditches turning into streams, streams into raging rivers, and rivers overflowing and inundating large regions of land. UPDATE (4/17/01): Hi, Jim, if your viewing this, remember we talked about this prediction last year? It looks like it's going to happen after all, about eight months later than predicted. The Weather Channel, AP, and CNN are predicting that the Mississippi flooding will reach 1993 levels (right now it is approaching 1993 levels, having surpassed the second-worst 1965 floods). It looks like I may at least get a CLOSE on this one, if not an ADJACENT FULFILLMENT. We'll have to see what happens. Four states affected so far: Minnesota, Wisconsin, Iowa, and Illinois. The National Weather Service said the most recent rains in the area were not sufficient to worsen flooding, but added that severe thunderstorms were set to march across the upper Mississippi Valley into Saturday. It said those could produce "very heavy rain which could cause flooding on the tributaries that feed the Mississippi." The big river was out of its banks along 400 miles from Minnesota and Wisconsin south into Illinois and Iowa. While the river was falling slowly in the northernmost sections, it was rising from Prairie du Chien south, and towns that will not see the crest until next week were erecting sandbag barriers and reinforcing existing earthen levees against the highest water seen in those areas since 1965. The Mississippi, combined with the Missouri, which flows into it near St. Louis, forms the continent's longest river system. The amount of water from spring thaws following heavy winter snows and rains now coursing through the upper parts of the valley was hard to conceive. The U.S. Geological Survey said the flood crest when it passed La Crosse, Wisconsin, earlier this week was measured at 224,000 cubic feet per second -- enough to fill several hundred large swimming pools every minute. By comparison, one swimming pool 20 feet long, 12 feet wide and 8 feet deep would hold 1,920 cubic feet of water, filled only once. President Bush has issued a statement, saying that he has directed Federal Emergency Management Agency (FEMA) director, Joe Allbaugh, to work with state and local officials as they the track damage. Mr Bush has also promised to monitor the flooding while he is in Canada this weekend for the Summit of the Americas. A 665km ( 413 mile) stretch of the upper Mississippi has been closed to commercial traffic and the owners of small boats have been advised not to travel on the river. UPDATE (4/28/01): In the end, the flooding of the Mississippi River was the second-worst of all time, nearly reaching the historic 1993 level. As the story developed, no two news agencies could agree whether this flood was as bad as the one in 1965 or worse, approaching 1993. By the time it was quite obvious that this was the second "thousand-year flood" to hit the Midwest in eight years and about as bad as 1993, most reporting was being done by CNN in the form of human interest accounts about the townspeople of Davenport, Iowa. Since most other areas were prepared with dikes and sandbags, the story got downplayed in significance and focus shifted to the plight of one city. That is why there were no further updates on this page: I was looking for complete on-line articles that dealt with the over-all scope of the flooding, but only found brief references or summaries contained in "Davenport exclusives." Nevertheless, facts are facts. The Midwest experienced its second-worst flood of all time and this prediction has been FULFILLED eight months late in April 2001, adjacent to the projected vector of August 2000. In November/December 2000, it will be northern and western Europe's turn -- the worst flooding since records of floods were kept. UPDATE (11/2/00): From October 14 to October 18, Italy and Switzerland were hit by the worst flooding in a century or more. The rivers Po and Ticino reached their highest level in more than 50 years while Lake Maggiore was brought to its highest level in 160 years. 35 people were killed. Now, at this writing, Britain is suffering from its worst flooding since 1947. UPDATE (11/5/00): Well, I may have been wrong about the US floods, but I seem to be right on target with northern and western Europe. Even the timing is correct. Things need not get any worse for me to claim this prediction as FULFILLED, especially with the year 1625 being evoked regarding the River Ouse and other reports now saying that this may be Britain's worst flooding in hundreds of years! 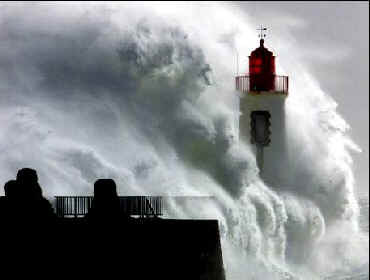 (Right) Deluge hits coast of France in November during flooding of Britain. 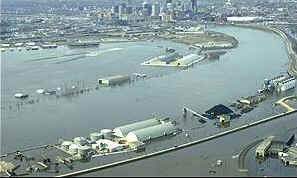 UPDATE (11/24/00): Flooding in Britain has continued throughout the month. The ground is now so saturated that the Environment Agency has warned that the risk of additional floods will persist for months. On November 17, it was reported that heavy rains washed trains from their tracks in Siciily and uncovered corpses buried for over a hundred years in northern Italy. Meanwhile, as the month of November continues, Sweden is experiencing its worst deluge in a century. NEW PREDICTION: 7/7/99 -- It has been said that "a picture is worth a thousand words." It should be quite clear from the formulaic title, pictures, and captions above that I am concerned about the welfare of several potential female celebrities in the year 2000 whose first name will either be "Gia" or a synthesis of "Jean" and "Gia." However, the specific danger facing her is still unclear, although the ultimate result is sadly quite apparent. UPDATE (11/8/99): The doom vector I have calculated, thus far, is broad: June-November 2000. The onus currently appears to be more on September than any of the other months. 1) Presentation One: Jean + Jean + Jean + Gia = ? That the combined misfortunes of the "Jean" and "Gia" personalities, all of whom share the same time line of doom, will result in a tragedy or near-tragedy for one or two female celebrities whose first name is similar: "Jean," Gina," "Gia," etc. In addition, on November 5, 1999, I discovered that actress Dorothy Jean Dandridge was also established prominently in the same time line of doom shared by Jean Harlow, Jean Seberg, and Gia Carangi. Thus far, it appears that this presentation was a complete failure, although not without some interesting ironies. 2) Presentation Two: Individual Scenarios. The doom of one, some, or all of these ill-fated women may be repeated by female celebrities who do not necessarily share a similar name (i.e., "the Jean Seberg scenario," "the Dorothy Jean Dandridge scenario," "the Gia Carangi scenario," etc.). UPDATE (3/21/02): Halle Berry has admitted she attempted suicide in the year 2000 by asphyxiation, but saved herself at the last possible second. I projected that a black actress would, like Dorothy Jean Dandridge in 1965, commit suicide sometime around September 2000. Halle, who did suffer an auto accident early that year, played the role of Dandridge in an HBO film in 1999. Her admission tonight has vindicated my prediction. UPDATE (9/19/00): Was the apparent suicide death of British TV star Paula Yates a FULFILLMENT of the Jean Seberg and Dorothy Dandridge scenarios? Seberg committed suicide in 1979 and Dandridge in 1965 -- both on the same base 7 time line as 2000. Both were found dead on September 8 and Yates's body was discovered September 17 (1 + 7 = 8 in conventional numerology). The MO for all three is remarkably similar including the state of the bodies. The ages were also close: Seberg 40, Yates 41, and Dandridge 42. 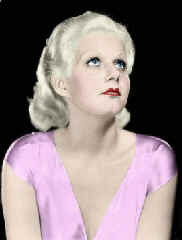 And like Seberg, the trauma of another's death may have led to the television star's own death. UPDATE (3/9/00): Was AIDS-Striken Superstar Ofra Haza an Israeli Gia? Was this a FULFILLMENT of the "Gia Carangi scenario"? Click symbol link below to see detailed update both linking Ofra Haza in 2000 to Gia Carangi in 1986 and weighing the possibility that she may not be the last. For more information, click Ö.
JANUARY 26, 2001 -- MAGNITUDE 7.9 EARTHQUAKE DEVASTATES INDIAN SUBCONTINENT -- NEW DELHI, India -- A severe earthquake rolled across the entire Indian subcontinent on Friday, killing scores of people and injuring hundreds as it rocked buildings in Pakistan, India and Nepal. The Associated Press said the toll could be as high as 140. The 7.9-magnitude quake killed 136 just in India's arid western state of Gujarat, Home Minister Haren Pandya was quoted as saying by local television stations. "We are tackling the situation on a war footing," Pandya told a news channel, adding that 100 buildings had collapsed. There were also reports of mine cave-ins, train derailments, broken water pipes, and downed power and phone lines. The quake -- which the U.S. Geological Survey reported on its Web site as having a preliminary magnitude of 7.9 -- struck at 8:46 a.m. (0316 GMT), just as India was preparing to celebrate its Republic Day parade.The Meteorological Department in New Delhi said the earthquake was India's biggest since 1956. The epicenter was the Rann of Kutch, a desert plateau along the border between Pakistan and India, according to the Indian Meteorological Institute, about 190 miles southeast of the Pakistani capital of Karachi. Rescuers pulled 18 bodies from the rubble of two collapsed buildings in the Indian city of Surat, 580 miles west of New Delhi. And in Rajasthan's Morbi township, 19 students celebrating the Republic Day are feared trapped under the debris of their college premises. The quake was also felt in Bombay, India's financial and entertainment capital, where residents fled tall buildings as pictures and cupboards shook. In Hyderabad in Pakistan's Sindh region, emergency crews sifting through the wreckage of a fallen two-story house found the bodies of a child and an adult, and were searching for more victims. The identities of the victims were not given. It was the same in Madras, on the eastern coast of India and in Pondicherry, further to the south, where officials with loudspeakers urged panicked residents to be calm. Millions of Hindu pilgrims sleeping in tents at India's Kumbh Mela festival in eastern Uttar Pradesh, 930 miles east of Karachi, felt the ground sway beneath them, but there were no reports of panic. Corinth (Greece) and Ephesus (Turkey) then in perplexity. The base 7 system indicates powerful influences from two previous seismic events will result in a massive earthquake in India or Sri Lanka in September 2000. However, according to Quatrain 3.3, astrological evidence provided by commentator John Hogue (1997) states such a quake is most likely to occur between July 1 and August 2, 2000. Interestingly, the astrological dating comes quite close to the September 2000 vector dated by the base 7 system. It also appears that at the time of the quake Greece and Turkey will become involved in a war or will be plagued by terrorism, possibly Kurd-related. It is also possible that these two countries will instead be rattled by major earthshocks again as they were in 1999 at the time of the India quake. 1) There have been an unusual number of large meteor sightings reported in the US and Canada. A very large meteor impacted the west coast of Australia on July 9. Speculation continues to mount that a field of debris from a comet impact with Mars is headed our way. Perhaps these are only the smaller pieces that have been seen and felt thus far. 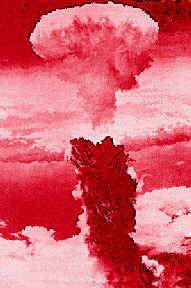 2) A nuclear strike or a nuclear test can also cause the earth to tremble and would certainly be heavily "reported." UPDATE (1/26/01): My apologies with the tardy FULFILLMENT of this prediction. But I have warned repeatedly in my letters, newsletters, the email forums, and various pages on this site that my projections can be off by as much as four months. I made a point of repeating this warning at the time of the El Salvadore quake and advised to keep an eye on predictions projected on this page for September to December 2000. I repeat this warning again. I do not know whether this earthquake fulfills line 3 of Nostradamus' prophesy in Quatrain 3.3 above. If it does, then much blood may soon be shed in Turkey and Greece as well. In any case, today's temblor does match my base 7 prediction for a massive September 2000 quake in India -- four months late. This earthshock, along with the one in El Salvadore, may be the trigger for a chain reaction of massive earthquakes worldwide. The ultimate result may be the universal catastrophe prophesied by Edgar Cayce and the Book of Revelation (see the 2001 (Part One) page). January 26, 2001 -- AHMEDABAD, India (CNN) -- Fear gripped the Gujarat state of western India on Friday, triggered by aftershocks from a 7.9 magnitude earthquake that killed at least 1,792, injured thousands, derailed trains and caused widespread power blackouts. As rescue workers dug through the rubble with cranes, sticks, even bare hands in search of trapped survivors, others prepared to sleep in the streets fearing their damaged homes would collapse. 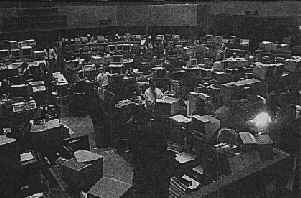 Warnings were issued via television, radio, and hand-held loudspeakers urging residents who had not already done so to flee their homes. Officials at the local command center said the death toll had risen to more than 1,790 with more than 4,000 injured and another 2,000 missing. Another four people were killed in Pakistan. The U.S. Geological Survey in Golden, Colorado, put the magnitude of the quake at 7.9 and said aftershocks could be expected for days or even weeks. The powerful quake was centered in the arid Gujarat state and was felt across Pakistan, Bangladesh and Nepal. Indian Prime Minister Atal Behari Vajpayee called a meeting of his cabinet to discuss the emergency and urged utmost attention to relief efforts. "A great tragedy has occurred. 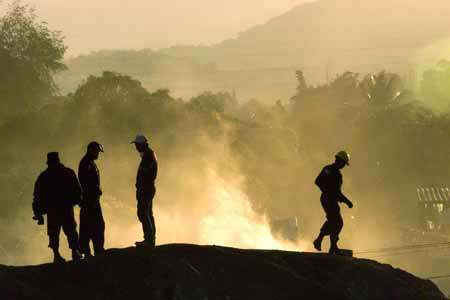 Many important parts of the country have been badly affected," he said. "This is the time for people to rally around and fight the calamity which has overtaken us." The quake struck at 8:46 a.m., centered near the desert resort town of Bhuj about 290 kilometers (180 miles) southeast of Hyderabad, Pakistan. Most of the damage was reported in Ahmedabad the state's commercial center, about 400 kilometers (249 miles) away. CNN's Suhasini Haider said officials are urging people to leave their damaged homes to prevent more deaths and injuries. Gujarat's state home minister, Haren Pandya, said 100 buildings had collapsed throughout the province. Rail lines were also damaged, reportedly causing some train derailments. "The whole state has been affected. Communications have been disrupted all over the state," Pandya said. 30 Jan 2001 04:52 GMT -- BHUJ (Reuters) - India's defence minister said the death toll from the country's worst earthquake could be as high as 100,000 and the number of injured may be double that, as the search for survivors entered its fifth day. But officials in the western state of Gujarat, the area worst hit by Friday's quake, said they doubted the figure was that high, and a spokesman for Prime Minister Atal Behari Vajpayee said it was too early to tell what the final toll might be. Homeless people in shattered towns and villages across Gujarat spent a fourth night in the open, some beside white bundles containing bodies awaiting cremation. 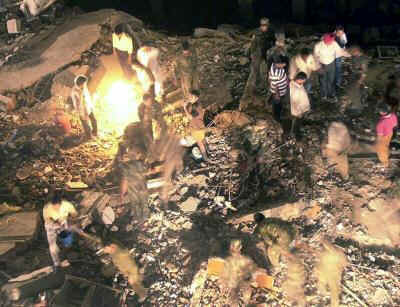 Others waited to ensure a proper cremation for dead loved ones still trapped beneath the rubble. Rescue workers plucked two boys and a 90-year-old woman alive from the debris in Bhuj on Monday but hopes were fading of finding more survivors as the stench of rotting bodies raised concerns about the outbreak of disease. "If one talks in terms of loss of human life, then one is looking at perhaps 100,000 people at the moment," Defence Minister George Fernandes told British Broadcasting Corp. But Gujarat Home Minister Haren Pandya said the state government still estimated the toll at between 15,000 and 20,000. "Our estimate is based on bodies recovered, missing people, survey of people still possibly buried under the debris and looking at village records," he told Reuters. H.K. Dua, information adviser to Vajpayee, said it was too early to project a final toll but that it would certainly rise. "These are just guesses. Bodies are under the rubble. Nobody can give the figure unless the bodies are counted," Dua said. "Nobody disputes the 20,000 figure. It is bound to go up ... "
DECEMBER 7, 2000 -- 7.4 EARTHQUAKE ROCKS TURKMENISTAN AND IRAN -- BEIJING (Reuters), TEHRAN (IRNA) -- An earthquake measuring magnitude 7.4 rocked the central Asian nation of Turkmenistan late on Wednesday, the China Seismological Bureau said. The epicentre of the earthquake, which also shook parts of neighbouring Iran, was about 250 miles northwest of the Turkmeni capital Ashgabat, state television said on Thursday. Earlier, an official with the China Seismological Bureau told Reuters the earthquake struck at 1711 GMT on Wednesday with the epicentre at 39.3 degrees north latitude and 54.6 degrees east longitude. Tehran, IRNA - An earthquake jolted cities of Gonbad, Minoudasht, Sari, Tehran, Karaj and Mashhad on 20:41 local time, the Mashhad Seismological Base reported on Wednesday night. The tremor was registered at 6.5 on the open-ended Richter scale and its epicenter was localized by the Mashhad Seismic Base in Iran's neighbor Turkmenistan, some 200 kilometers north of Gonbad Kavous. Further details were not available on the possible damages or casualties. NEW PREDICTION: 10/5/99 -- The quake that rocks India will be quite powerful. It will be the first in a series of catastrophic earthshocks that will usher in the time of universal earthquakes and earth changes predicted by Edgar Cayce for 2001. Iran will be next to suffer from the worst earthquake to hit that region in this century. Base 7 dating: September 2000. What Is the Likelihood of an Accidental Nuclear War? REMINDER (8/17/00): The one 2000-related prediction that I moved from this page to "Russia in News and Prophecy" was the possibility that danger existed for an accidental nuclear war or nuclear close call between Russia and the United States in September 2000. For the entire presentation as it appeared here, go to Russia in News and Prophecy. It is my belief and hope that, as in past cases, it will be a close call like September 1979 or January 1995. I should also mention that we may not hear about it for many months or a few years later. 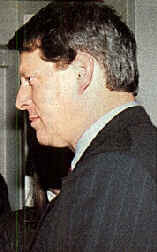 The January 1995 incident was not generally known about until it was reported in a documentary in 1997. The 1979 incident was reported in the major media several months later. UPDATE (9/16/00): If you are also following events on the Year 2000 (Part Two) page, then you are aware of the building threat of another US-British air assault on Iraq. However, the timing of such an operation is especially bad, since the danger of unleashing the "Mabus scenario" is extremely high at this time. Note that the dire consequences that would result from the death of Saddam, possible nuclear retaliation by Russia, is a very real possibility according to the report in the above marquee. This is a time to step back from the precipice. People have grown so accustomed to air assaults against Baghdad that they may never realise until it is too late that this time the wages of such a military action could be total thermonuclear war!!! UPDATE (11/15/00): There are unconfirmed reports on various message board forums that the hatches on Russia's nuclear ICBM silos were opened in October shortly after the attack on the USS Cole. I can find no official news report of this having taken place. If anyone has an official source for this information, please contact me at the email address posted near top of page in the End of 20th Century Email Forum entrance section. Thanks. I don't know who the "reliable sources" are, but I seriously doubt YOWUSA would fabricate something like this. Also, I have no idea where those who posted this event on forums got their information. I have read, unofficially, that the opening of the hatches may have been prompted by a concern in Moscow that Washington might trigger a major war in the Middle East by retaliating against the bombing of the USS Cole. Of course, for all we know, the Russians may have experienced a computer glitch. Often, cases of near-accidental nuclear war or nuclear war close-call are not reported to the public officially until many months or years after the incident took place. Some cases are never reported. I do believe, at least based on what was reported by YOWUSA, that the US and Russia came close to nuclear war in October 2000. We can speculate endlessly as to the reasons. I find it ironic that the timing of this incident was only a month removed from the September 2000 vector I projected above for the accidental or close-call nuclear war prediction. I therefore must conclude that I was right -- the prediction was FULFILLED in the form of a close call (how much closer do you want to get than opened silo hatches in a state of pre-launch readiness?). JANUARY 13, 2001 -- MAGNITUDE 7.6 EARTHQUAKE KILLS MORE THAN 32 IN EL SALVADORE AND GUATEMALA -- QUAKE EPICENTER ON PACIFIC COAST OF EL SALVADORE FELT THROUGHOUT CENTRAL AMERICA -- SAN SALVADOR, El Salvador (Reuters) - An earthquake measuring 7.6 magnitude on the Richter scale left more than 32 dead in El Salvador and Guatemala as it shook Central America and southern Mexico on Saturday, collapsing buildings and cutting power across the region, authorities said. "At the moment we have more than 30 dead reported," Carlos Lopez Mendoza, Red Cross spokesman in El Salvador told Reuters. He said the deaths occurred along the Pacific Coast in the southwest, near the quake's epicenter, and in the northern department of Santa Ana near the Guatemalan border. Guatemala National Disaster Commission spokeswoman Luis Lara said two children died in Halpatagua, near the border with El Salvador, when a house collapsed. The United States Geological Survey said it recorded the quake's epicenter about 65 miles southeast of El Salvador's capital, San Salvador, off the Pacific coast. "Based on its location and size, we believe this earthquake may have caused substantial damage," USGS geophysicist Bruce Presgrave said. "This, very definitely, is a dangerous quake." The quake occurred at 11:34 a.m. and was felt across El Salvador, Guatemala, Nicaragua and Honduras, as well as the southern Mexican state of Chiapas. In the San Salvador suburb of Santa Tecla a hillside collapsed on a neighborhood, burying more than 200 homes and killing at least a dozen people, witnesses said. "I saw 20 bodies," Ivan Manzano, based in El Salvador for Miami broadcaster Telemundo, told Reuters. "A mountainside collapsed on a borough. There are people buried in the rubble there." Local press reports said a hospital collapsed in the southern city of San Miguel and a church fell in the northern city of Santa Ana. The highway between San Salvador and Santa Ana, the country's second city 35 miles to the north, was blocked by a landslide. Hospitals in San Salvador moved patients out into the streets in order to receive the injured, Reuters photographer Luis Galdamez said. Local radio in El Salvador and Guatemala said the quake knocked over buildings across Central America. "It was a shockingly strong earthquake that seemed to last for ages, pictures and mirrors were bouncing off the walls," a spokeswoman from the U.S. Embassy in San Salvador told Reuters. "Helicopters, presumably carrying rescue crews, are flying around the capital but it appears that the worst is not here in the capital, but in the countryside." NEW PREDICTION: 9/24/00 -- A devastating earthquake will strike El Salvadore in October 2000. It will be a 7.5 or greater, but if lower, no less destructive. UPDATE (1/13/01): This prediction has been FULFILLED in all respects. Even the projected magnitude is correct. The timing and ferocity of this earthquake is also intimately related to the Central America Earthquake prediction near bottom of page. 15 Jan 2001 00:28 GMT (Reuters) -- SAN SALVADOR, El Salvador (Reuters) - At least 381 people were dead, 779 injured and hundreds missing in El Salvador on Sunday, a day after a strong earthquake struck the Central American nation, setting off landslides and burying hundreds of homes. President Francisco Flores said in a news conference that the death toll could go higher and material damage was still incalculable. "We have made a request to the government of Colombia for 3,000 coffins to put at the disposition of citizens," he said. "Any evaluation of damage and what it will take to rebuild is still very premature." Some 1,336 people had been evacuated, the National Emergency Committee said. The committee estimated earlier in the day that at least 1,200 people were still missing. Most of the dead were being pulled from the rubble in the San Salvador suburb of Santa Tecla, where a massive mudslide engulfed as many as 500 homes. "Everything was buried, and my entire family is dead," one Santa Tecla resident said. Hundreds of emergency workers and volunteers worked alongside cranes to shovel dirt from around collapsed homes in a sea of mud, tree limbs and rubble while dazed survivors milled around the mounds where their homes once stood. Guatemalan officials said four more bodies were discovered in that country on Sunday, raising the death toll there to six from an earthquake felt across Central America and as far north as Mexico City. The 7.6-magnitude quake occurred at 11:34 a.m. on Saturday and was felt across El Salvador, Guatemala, Nicaragua and Honduras and as far north as Mexico City. Update from Reuters (1/16/01) -- SAN SALVADOR (Reuters) - El Salvador raised the confirmed death toll from the devastating earthquake in El Salvador to more than 600 with about 500 people still missing and feared dead. Strong aftershocks from the 7.6 magnitude quake on Saturday rattled buildings and triggered fresh landslides throughout the day, frustrating rescuers whose hopes of digging out more survivors were all but gone. Police raised the known toll late on Monday from about 400 dead to 609, with 2,365 people injured and about 38,000 homes throughout the small Central American nation partly or totally destroyed. 15 Feb 2001 -- SAN SALVADOR, El Salvador (Reuters) - Hopes of finding survivors amid the rubble of El Salvador's quake-ravaged rural towns dwindled on Thursday, as the official death toll from the tiny nation's second earthquake in a month climbed to 274. Guatemalan firemen and Honduran rescue workers hooked up with Salvadoran army units as the search for survivors shifted to isolated rural areas close to the epicenter of Tuesday's 6.6-magnitude quake. But as night fell, rescue teams turned up nothing among the collapsed walls, fallen rafters and shattered roofing tiles of the more than 15,000 destroyed or damaged homes, as local hospitals called for fresh supplies of blood for many of the 2,432 injured. "We hope we may still find survivors," said Salvadoran Rescue Command spokesman Eduardo Rivera. "But it would be a miracle." A group of 80 rescue workers, including troops and volunteers, pulled 18 bodies from collapsed homes on the slopes of Chichontepec volcano in quake ravaged San Vicente department, around 30 miles (50 kms) east of the capital on Wednesday. Up to half the houses in San Vicente town were flattened, killing 66 people and injuring more than 200, and in the nearby towns of Analquito, San Emigdio, Guadalupe and Verapaz some 80 percent of homes were destroyed. Salvador's National Emergency Committee pegged the number of homeless nationwide at 122,800 late on Wednesday, adding that the quake had triggered 25 landslides and destroyed six churches. Seventy-six people were still listed as missing. The devastating quake rattled through eastern El Salvador one month to the day after one of 7.6 magnitude killed more than 800 people and left thousands homeless in the impoverished, coffee-exporting nation of 6.2 million. Hundreds of people remain unaccounted for from the January earthquake, which triggered a landslide burying whole blocks of the capital city's Santa Tecla suburb under mud and made thousands homeless. Rhodes, Istanbul with Barbarian blood is stained. UPDATED INTERPRETATION: 6/6/00 -- There is no numerological or astrological calculating to do here. We know that one remaining critical presidential election is scheduled to be held in the year 2000 by the mightiest power on earth: the US election of November 7. Line 1 seems to indicate Russia and the United States as "those of the arctic pole" since both powers hold territory in the far north that nearly joins. If they are "united" then they cannot be at war. Thus, it would appear that a "false peace" will continue between Russia and the US until at least November 2000. Then again, it may not be so "false" after all. It could well be that the two great powers will have a common enemy to ally against. 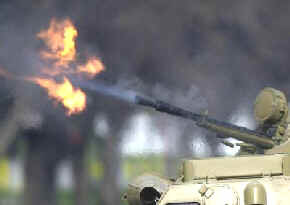 This may set back aspirations on the part of Moscow to regain Eastern and Central Europe by force for several years. Then again, after having been united ("unis enemble") for the last thirteen years (since the first "successful" summit between US President Ronald Reagan and Soviet President Mikhail Gorbachev and the signing of the INF Treaty in December 1987), it may be November 2000 when the two will go to war with each other in "the Orient." For Nostradamus "the Orient" was merely another way of saying "East." From his perspective in the 16th century the East was not only Asia and the Middle East, but also Eastern Europe. Thus, we cannot be certain if the great fear and dread is a war in the Pacific, the Middle East, or the Balkans (or possibly all three). The "great trembling" could be a clue linking the identity of the nation electing the new leader to another phenomenon. November (the US election) may not be far from the great earthquake of the sixth seal prophesied by Edgar Cayce and the Book of Revelation. My calculations, thus far, indicate this will happen in March/April 2001. The temblor of line 3 is likely to be a terrifying precursor that will occur in November. Alternatively, the "great trembling" could simply be describing a fearful population in America at the time of the election. Line 4 is yet another warning to Turkey and Greece that more superquakes may be on the way. On the other hand it could also be describing conditions of warfare in both countries wherein a great deal of Moslem blood is shed (for Nostradamus and his contemporaries the term "barbarian" was usually applied to non-Christian peoples living in Eastern Europe, North Africa, and the Middle East). UPDATE (9/12/00): Are we witnessing the fulfillment of line 1 in the Barents Sea? It appears there will be a resumption of international activity in the dark, icy waters of the Arctic between early October and the November U.S. presidential election. The Kursk tragedy will once again dominate the news just before "a new leader is elected" at a time of "great trembling." AUGUST 17, 2000 -- BRITISH, NORWEGIANS JOIN RUSSIANS IN TRYING TO RESCUE STRICKEN SUB IN BARENTS SEA -- MANY OTHER SHIPS SEEN IN AREA ACCORDING TO NORWEGIAN CAMERA TEAM -- MURMANSK, Russia (CNN) -- A British mini-submarine and a team of Norwegian deep divers are being dispatched to aid a Russian flotilla trying to rescue 118 sailors trapped in the stricken Russian nuclear submarine Kursk. The Russian navy said on Thursday morning that their overnight rescue attempts had failed. Russian Prime Minister Mikhail Kasyanov called the Kursk's situation "next to catastrophic," Interfax news agency reported. The British and Norwegian rescue teams are unlikely to reach the accident site until Friday or Saturday. The Russians accepted their aid after days of hesitation. The British LR5 mini-sub was loaded onto a supply ship at Trondheim, Norway, early Thursday morning. It will be rushed to the rescue site in the Barents Sea off the northwestern Russian coast, about 250 kilometers (185 miles) from Norwegian territory. The LR5, built in 1978, is battery-powered and can dive to 1,500 feet below sea level. It can bring up 15 men at a time, after attaching a rescue collar to the sub, and is expected to be able to bring up about 45 men within an eight-hour period. Its batteries are said to last between eight and 12 hours before needing to be recharged. British Royal Navy Cmdr. David Stanesby said the Norwegian ship had been chosen because it has a unique capability to hold steady in rough seas, better enabling the mini-sub to do its work underwater. The Norwegian civilian ship DSV Seaway Eagle, with 12 to 15 professional deep sea divers on board, has been diverted from an offshore oil field to the crash site and is also expected to rendezvous with the mini-sub and the Russian flotilla on Saturday. A duty officer contacted at Russia's Northern Fleet home port of Severomorsk, said, "There has been no progress." Attempts to evacuate the crew failed because of high winds and poor seabed visibility, although RTR state television said on Thursday morning that the weather had improved. A Norwegian freelance camera team managed to take exclusive videotape of the rescue zone for CNN, flying their Piper Navajo twin-engine plane as low as 10 feet above the sea to avoid radar. Pilot Sigurd Henriksen and photographer Anders Loberg say there were many ships in the area in addition to the four they filmed and that they were inside the Russian military's self-imposed restricted area for about four minutes. British officials said their submersible won't arrive at the site before Saturday. Adm. Vladimir Kuroyedov, the head of the Russian navy, earlier had said the 116 Kursk crew members were expected to run out of oxygen on Friday. But on Wednesday he said he believed that there was enough oxygen aboard the submarine to last until August 25. Vice Adm. Vladislav Iliyn said the order to seek international help came Wednesday after a telephone conversation between Russian President Vladimir Putin and U.S. President Bill Clinton. Putin described the situation as critical, and Deputy Prime Minister Ilya Klebanov said there was no sign of life aboard the submarine. But he said that did not mean there were no survivors. A U.S. intelligence analysis of the incident indicates that the Kursk suffered a catastrophic event on Saturday, and there has been no evidence since then to support Russian claims that any kind of communication was heard from inside the submarine as it lay helpless on the floor of the Barents Sea. Russian rescue capsules repeatedly descended through stormy waters Tuesday and Wednesday but, whipped about by currents, could not latch onto the submarine, lying at a sharp list 354 feet beneath the surface. Russian naval officials have said that the stricken submarine was in touch with surface ships by radio, and when that failed, possibly due to a power loss aboard the vessel, the crew began tapping code messages on the inner hull. But the U.S. analysis indicated there was no evidence to support the claim of tapping, even in the early stages of the rescue effort, according to a U.S. official familiar with the intelligence reports. 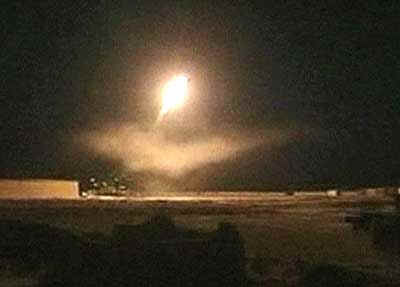 A U.S. analyst said there were two distinct explosions detected by monitors early Saturday (Washington time). The explosions were seconds apart and the second blast was notably larger than the first, according to the source. Instead of an alliance, "united together" may have been used by Nostradamus in its most literal sense. Although Britain could not be included among "those of the arctic pole," Norway and Russia obviously could. The nationalities of ships seen around the disaster area shortly after the tragedy by Norwegian photographers were also not known -- they may have been Finn, Swede, Pole, or Baltic. Although Russia told the United States it could participate in the rescue and salvage efforts on August 18, the operation was concluded before any American help could arrive. While it is true that America's involvement would have sealed the interpretation of line 1 as "those of the arctic pole [being] united together," all that was neccessary was that there be a concentration of various Northern European countries. Now the nations of the North have planned another mission in the Barents Sea in October. We'll know in the weeks and months ahead, I suppose, whether the Kursk tragedy, the August international efforts to save the crew, and now the planned October/November endeavour to recover the bodies are a fulfillment of the first line. If true, we will soon be seeing evidence of "great fear and dread in the Orient." The U.S. election, perhaps the one described in line 3, will take place on November 7 this year. UPDATE (10/1/00): Are we witnessing the fulfillment of line 2 in Israel and Yugoslavia? If the Kursk disaster and the arctic operation composed of Northern European countries and Russia in the Barents Sea was the fulfillment of line 1, then is the "great fear and dread" predicted to follow or coincide "in the Orient" now beginning? Two events are occurring simultaneously: the worst fighting between Israel and the Palestinians since 1996 and a dangerous political showdown in Belgrade that could well lead to a civil war in Yugoslavia -- one that may quickly widen to become a major Balkans conflict. OCTOBER 1, 2000  DEATH TOLL MOUNTS IN PALESTINIAN-ISRAELI CLASHES  WORST FIGHTING IN FOUR YEARS RESEMBLES "A WAR ZONE"  JERUSALEM (CNN)  Israeli troops battled protesters with tanks and helicopter gunships in bloody clashes across the West Bank and Gaza on Sunday that left nine Palestinians dead. Perched on rooftops and in abandoned buildings, Palestinian gunmen traded gunfire with Israeli troops as rioters cheered them on. The area's worst outbreak of violence in four years raised concerns that it could upset fragile peace talks. 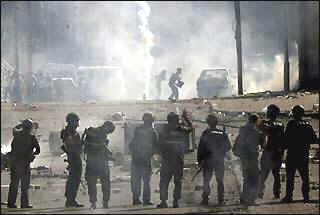 As gunfire rattled through the streets, the clashes resembled a war zone. Israeli tanks rumbled toward the Palestinian-run towns of Nablus and Ramallah in a warning gesture. But they held short of crossing outside their jurisdiction. And for the first time, Israeli Arabs joined the rioting, expressing solidarity with the Palestinians and venting frustration over what they see as years of discrimination and neglect. At least 26 Palestinians and one Israeli soldier have been killed during the past four days. More than 700 Palestinians have been injured, many by rubber-coated bullets fired at rock-throwing demonstrators by Israeli security forces. U.S. President Bill Clinton called Palestinian Authority President Yasser Arafat on Sunday evening, and spoke with Israeli Prime Minister Ehud Barak Saturday, to discuss the situation, the White House said Sunday. Each of the phone calls lasted about 20 minutes, said P.J. Crowley, National Security Council spokesman. "We are urging both sides to exercise maximum restraint and put an end to the violence," Crowley said. As the causalities mounted, the Arab League emerged Sunday from an emergency meeting and urged the U.N. Security Council to conduct an international investigation into "crimes against the Palestinian people and try the responsible Israelis before the International Criminal Court." Arab leaders such as King Abdullah II of Jordan and Foreign Minister Amr Moussa of Egypt warned the bloodshed was wrecking the peace process. Palestinians and Israelis continued to trade accusations about the root causes of the violence. Nobody disagrees that the clashes followed a visit last Thursday by Israel's hawkish opposition leader Ariel Sharon to a contested Jerusalem shrine. The site is known to Jews as the Temple Mount and to Muslims as Al Haram al-Sharif, or Noble Sanctuary. It is home to Judaism's holiest site, the Western Wall of the biblical Temple, and two mosques -- Al Aqsa and Dome of the Rock -- that mark the spot where tradition has it that the Prophet Mohammed ascended to heaven. Palestinians said Sharon's visit -- and his accompanying police security detail, thousands strong -- was a provocation. Sunday's deadliest battle was waged over Joseph's Tomb in Nablus on the West Bank, a tiny Israeli-controlled enclave smaller than a city block and ringed by a cement block wall and barbed wire. At one point, according to the Associated Press, two helicopter gunships swooped down and unleashed a barrage of fire, sending hundreds of Palestinians fleeing for cover. In addition to Nablus, firefights erupted in the West Bank town of Ramallah, in the town of Khan Yunis near the Egyptian border and at an Israeli army post close to the isolated Jewish settlement of Netzarim in Gaza. On the outskirts of Ramallah, Israeli troops commandeered a luxury hotel, with Israeli snipers firing from the rooftop and the ground floor dining hall at Palestinian gunmen taking cover in abandoned buildings and behind cars. Dozens of guests and journalists were trapped in the lobby of the New City Inn as the steady staccato of gunfire was heard outside. Near Netzarim, scores of gunmen, cheered on by hundreds of Palestinian rock-throwers, took aim at a fortress-like Israeli outpost. One gunman knelt behind a low wall as he fired his M-16 assault rifle. The gunbattles were reminiscent of firefights in September 1996, which also erupted because of a perceived Israeli infringement on the Jerusalem mosque compound. At the time, Israel had opened an archaeological tunnel along the shrine. In the 1996 fighting, 59 Palestinians, 16 Israelis and three Egyptians were killed. In south Lebanon on Saturday, thousands of Palestinian refugees demonstrated against the killings. They marched through Ain el-Hilweh, the biggest refugee camp in Lebanon, chanting anti-Israeli slogans and burning an effigy of Sharon. "Sharon, we will never forget your massacres in Sabra and Shatila. The Aqsa mosque (in Jerusalem) is Arab and will remain Arab," read one banner. In 1983 an Israeli inquiry found Sharon indirectly responsible for the killing of hundreds of Palestinian refugees in Sabra and Shatila refugee camps in Beirut. He was defense minister at the time, during an Israeli invasion of Lebanon. For Nostradamus "the Orient" was a very large region that included not only Asia and the Middle East, but that part of the world we now know as Eastern Europe. The French seer often linked the fate of Hungary and "Pannonia" (former Roman colony which was comprised of northern Yugoslavia, portions of Bosnia and Croatia, and southern Hungary) with events in the Orient and the Levant (Mediterranean coast of the Middle East). He clearly predicts that war in the Balkans and Hungary will coincide with a war in the Middle East. It may be premature to conclude that this will happen now, but one can certainly sense with some justification that there is cause for "fear and dread" in the Middle East. If the second component of Quatrain 6.21 is now underway, I have to admit a certain sense of unease about what is portended by line 3: "a great sustained trembling" (of the earth?) 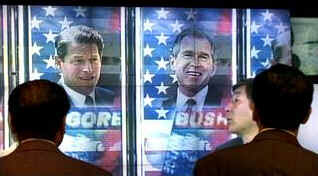 at the time of the US presidential election (or is it the election held in Yugoslavia?). UPDATE (11/8/00): It appears that Nostradamus is three for four regarding Quatrain 6.21. The vaguely written third line can be translated "a newly-elected one, sustained by a great trembling," or "a newly-elected one, a great trembling sustained." NOVEMBER 30, 2000 -- U.S. SUPREME COURT TO HEAR HISTORIC PRESIDENTIAL ELECTION CASE FRIDAY -- FOR THE FIRST TIME IN ITS 210-YEAR HISTORY, THE U.S. SUPREME COURT HAS AGREED TO HEAR PRESIDENTIAL ELECTION CASE -- WASHINGTON (CNN) -- Lawyers for Republican George W. Bush will urge the U.S. Supreme Court on Friday to overturn a decision by the Florida Supreme Court allowing manual ballot recounts after a deadline imposed by that state's legislature, court papers show. Democrat Al Gore's legal team will urge the U.S. Supreme Court to let that decision stand. The Gore team also will argue that the question of who won the presidential contest in Florida belongs in state courts, not the federal system, according to written filings. The U.S. Supreme Court will hear 11/2 hours of arguments beginning at 10 a.m. Friday in Bush v. Palm Beach County Canvassing Board, a historic case that pulls the nation's highest court into the controversy surrounding the razor-thin Florida vote on November 7. At issue in the case is whether the Florida Supreme Court violated federal election laws and the U.S. Constitution by extending the deadline for certifying the statewide vote in Florida from November 14 to November 26. In a 7-0 decision, the Florida Supreme Court ordered Florida Secretary of State Katherine Harris to add manually recounted vote totals from a handful of Florida counties to the statewide total and "certify the vote" 12 days after the deadline imposed by state law. Since certification determines who wins the Florida election, and its crucial 25 electoral votes, the Bush team argues that the Florida Supreme Court essentially overstepped its authority by postponing the November 14 certification by 12 days. Bush's lawyers want the U.S. Supreme Court to overturn the Florida Supreme Court's decision, saying it violates Article II of the U.S. Constitution, which says legislatures must appoint the electors, not the courts. They also accused the Florida Supreme Court of violating a section of the so-called "Title III" federal election law, which says the electors must be chosen by a process spelled out in statutes passed prior to Election Day. The Gore team, in papers filed Thursday, said the Florida Supreme Court did not usurp the legislature's authority and was only interpreting contradictory state elections laws and reaching a verdict based on its own judicial reasoning. One state election law said the secretary of state "shall" ignore hand recounts after the November 14 deadline and another which said she "may" do so, the Gore team argued. Gore's lawyers also invoked the historic reluctance of federal courts to get involved in state election problems unless there are explicit violations of the U.S. Constitution or federal laws in urging the U.S. Supreme Court to deny Bush's claims. Meanwhile, the Friday hearing comes 11 days before yet another deadline set by federal law. All state legislatures must "appoint, " or formally name, their electors by December 12. Either way, it hardly matters. The "great trembling" is obviously the angst, suspense, and, yes, chaos the United States has been plunged into over the closest and strangest election in its history. It may be only a few days or it may be weeks before the issue of who actually won the election is resolved. Also, there is no guarantee that a resolution will be looked upon favourably by all voters, many of whom believe the electoral collage system is unfair and others who believe that the voting results in Florida were "tainted." There is danger of a constitutional crisis. There are already small protest groups forming in the streets. Meanwhile, it appears more and more likely that the suspense ("trembling") will drag out for weeks. This situation could turn very ugly indeed before the "newly-elected one" finally takes power. Indeed, the country could become quite seriously divided even after the resolution. It certainly would appear that this historical and troubling election is what Nostradamus was referring to in line 3. That leaves us with only line 4: the spilling of blood in Turkey and Greece. Thus far each line has been fulfilled roughly a month apart beginning with the Kursk tragedy. That indicates war will come to the Balkans in either December or January, the full extent of which is impossible to gauge at this point. In any event, with lines 1, 2, and 3 either fulfilled or continuing to be fulfilled, we must all be wary of the implications of line 4: what may well be the beginning of World War III. UPDATE (12/14/00): It appears that the great period of suspense has finally ended. Republican presidential nominee George W. Bush is now President-Elect George W. Bush. There, of course, always remains the possibility of some other form of political or legal fallout to come (evidence that brings to light vote tampering or 'vote fixing' by Floridan Republican officials, especially Florida Governor Jeb Bush), a change in the minds of any key vote-swinging electors (who might change their minds and vote for Gore instead of Bush), or civil unrest by Americans who, after a period of consideration, conclude that their vote no longer counts (which is essentially what the Supreme Court has decreed in its ruling if one reads between the lines). In the meantime, "great fear and dread" continues in the East: in Kosovo, in Israel, in the Palestinian territories, along the Lebanese-Israeli border, in northern Iraq where new fierce fighting between Turkish and Iranian Kurds has broken out, in Afghanistan awaiting a possible retaliatory strike against Osama bin Laden, in the form of general anticipation of what Saddam Hussein or Osama bin Laden might do next, and in the Taiwan Strait. And what is next? According to line 4, it will involve the shedding of blood in Greece and Turkey. A major Balkan conflict? A Middle East war so dreadful it becomes inter-regional, spreading to southern and eastern Europe? Or World War III? UPDATE (1/15/01): Yet another dimension to "the great trembling" of line 3 may now be revealing itself with a massive earthquake in El Salvadore and what may be foreshocks in Los Angeles. Is it not possible that it is what I initially believed? -- a period of intense earthquake activity accompanying the US election (in this case, preceding, accompanying, and immediately following the inauguration of George W. Bush?). If this is true, the massive quake in Central America may not be the end, but the beginning of a seismic rollercoaster ride that will have earth's inhabitants screaming to get off. If so, line 4 involving the spilling of blood in Turkey and Greece may not be fulfilled until this seismic nightmare ends -- whenever that is. UPDATE (3/18/01): Now, at last, we come to the final bend in the road. It is all too clear that the stage is being set for line 4: a Balkan war that will spread to Greece and Turkey. To Nostradamus and his 16th-century peers, the word "barbarian" was applied to Moslem peoples, especially those of North Africa, Turkey, and the Middle East. It appears from the final line that Islamic soldiers, and possibly civilians, will shed their blood in Greece and Turkey. The current Balkan conflict in Macedonia involves ethnic Albanians from both Yugoslavia and Macedonia, who are Moslem. Greece, which shares a common border with Macedonia, is not far from some of the fighting and on high alert status. Athens is also pledging military aid to the Macedonian government. In addition to ethnic Albanians, Macedonia also has an ethnic Turk population. Thus far, Turkey has said nothing about the conflict. In time, if line 4 is to be applied to this war, both Ankara and Athens will be fighting in Macedonia -- and quite possibly with each other. Nostradamus also predicts that "the Albanians" will invade Macedonia and "the Athenian field" (Greece). This, along with a possible war with Turkey, could explain the shedding of barbarian blood on Greek soil. I might also add that, in addition to the on-going urban warfare taking place between Israel and the Palestinians, the conflicts in Macedonia and southern Serbia may also be considered part of "the great fear in dread" in the East. UPDATE (6/21/01): It is taking a considerable time for the Turkish-Greek element of this quatrain to play out. The half-war in Macedonia has yet to expand into a major Balkan conflict. Still, Macedonia, along with the crisis in the Middle East and continuing tensions between China and Taiwan, contributes to the "great fear and dread" in the East in line 2. Regarding line 3, there is no question that various parts of the world were plagued by massive earthquakes and volcanic eruptions during the period between the US presidential election and the inauguration of President George W. Bush -- culminating in the Seattle Earthquake of February 2001. The election itself was a political earthquake the like of which had not been seen before in America's history. The recent summit in Europe has re-affirmed the US-Russian relationship and a new friendship between Vladimir Putin and George W. Bush, even if it turns out to be one only of appearances. Together with the Kursk tragedy last year which unified the nations of North, line 1 is fulfilled both ways. So, we wait to see if line 4 plays out in the Balkans or, like 1988 and 1996, remains only 75% fulfilled. OCTOBER 7, 2000 -- WESTERN JAPAN HIT BY STRONGEST QUAKE IN 5 YEARS -- TOKYO, Japan (CNN) -- Nearly 40 people were injured on Friday when western Japan felt the rumblings of a magnitude 7.3 earthquake, the most intense Japan has experienced since the 1995 Kobe quake killed 6,000 people. But damage from Friday's quake appeared limited as it swayed skyscrapers in Tokyo and shattered windows and knocked people off their feet in other areas of western Japan. "It was so strong that I couldn't stand up," Shinichi Nagami, a government spokesman in Sakaiminato told national television. 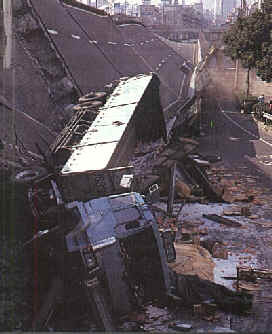 The National Police Agency reported at least 39 injuries, the most severe of which were broken bones. Reuters news agency reported that at least two people were buried alive in landslides triggered by the quake, which was centered in the area around the Sea of Japan between Yonago City and Matsue, about 1,134 kilometers (700 miles) west of Tokyo. The Japanese meteorological agency said there was no danger of a tsunami. At a depth of 6.4 miles, it was a shallow quake, said John Bellini, of the U.S. Geological Survey, in Golden, Colorado. The first jolt was followed by several aftershocks, the strongest of which -- with a magnitude of 4.2 -- hit nearly three hours after the original one. The tremor struck around 1:30 p.m. (0430 GMT). "I felt a big jolt and then there was shaking for at least 10 seconds, and I couldn't stand up," said a reporter with public television station NHK. Japan's meteorological agency warned there was a 40 percent chance of another strong quake hitting the region in the next few days. It urged residents to take extra precautions, and to avoid areas where land that may have been loosened could turn into landslides. Video taken inside the NHK newsroom during the earthquake showed lights swaying from the ceiling. NHK also broadcast images of display cases in a pharmacy in Yonago City that had tumbled to the ground, their contents of bottles strewn across the floor. In Shimane prefecture, a local official said there were reports that some houses had collapsed. A magnitude 7.0 earthquake is capable of causing heavy, widespread damage. The shaking halted Shinkansen bullet train services between Toyohashi in Aichi prefecture, in central Japan, and Shin-Iwakuni in Yamaguchi prefecture, in western Japan. The tremor shook Japan's Suzuka racetrack, where the penultimate Formula One race of the season is scheduled for Sunday. Journalists headed to the doors of the track's media center as the building swayed. NEW PREDICTION: 1/17/00 -- In what may be the true beginning of the Cayce cataclysm, Eastern Russia, Japan, and Tibet will be devastated by massive earthquakes -- magnitude 8.7, one perhaps as high as 9.0 or greater. This may happen all in a matter of a few days or over the course of a few months. The vector of disaster is November 2000. It is worth noting that the US presidential election occurs on November 5 and, according to Quatrain 6.21, a new leader will be elected accompanied (or "sustained") by "a great trembling." October 7, 2000 -- YONAGO CITY, Japan (CNN) -- Seventy-four people were injured in the strongest earthquake to rattle Japan since the 1995 tremor in Kobe killed 6,000 people, Japanese officials said on Saturday. The quake on Friday afternoon destroyed 22 buildings, heavily damaged 125 others and caused minor damages to 1,084 buildings, officials said. More than 2,500 people had evacuated their homes by Saturday. Meanwhile, meteorological officials said there had been 299 aftershocks, the strongest measuring 4.9 on the Richter scale. They said there was a 40 percent chance that another strong quake could hit the region within days. DECEMBER 27, 2000 -- ICY STORM PARALYZES NEW MEXICO, ARKANSAS, OKLAHOMA, NORTHERN TEXAS -- WIDESPREAD POWER OUTAGES -- LITTLE ROCK, Ark. (Reuters) - A deadly storm bearing ice and snow moved across the mid-southern United States on Wednesday, paralyzing Arkansas and Oklahoma with widespread power outages and ice-coated roadways. Half a million people had no electricity as a layer of ice up to two inches thick toppled trees and snapped power lines from New Mexico to Arkansas. Police said 16 people died in weather-related accidents after the storm started in New Mexico on Christmas Day. As the system moved eastward, it dumped a record 20 inches of snow on northern Texas. The storm caused Oklahoma Gov. Frank Keating to declare his state a disaster area (on) Wednesday. Arkansas, still recovering from a fierce ice storm two weeks ago, appeared hardest hit, with highways closed around the state and 300,000 people left without power. In western Arkansas, newspaper offices closed down for the first time in their history and the U.S. Postal Service suspended mail delivery. The devastation was so widespread that Arkansas Gov. Mike Huckabee dispatched National Guard troops in all-terrain Humvees to search for people stuck in frozen buildings and disabled vehicles. Brigades of chainsaw-wielding civilians cleared trees from streets and houses, while displaced people headed for makeshift shelters. "It's really the equivalent of having a nuclear device go off, without the mushroom cloud or radioactivity," Huckabee told CNN television. "Virtually everything is shut down. We have 11 or 12 counties where every single person has lost power, phone service and water." He spoke by cellular telephone, because the governor's mansion had neither electricity nor a working telephone line. Huckabee said it was likely that some areas of his state would not have power for at least 10 days. In Texarkana, which straddles the Texas-Arkansas line, officials ordered a nighttime curfew and froze all prices to prevent merchants from capitalizing on the city's troubles. "Everywhere you look, trees are snapped like match sticks. Power lines are down everywhere and most of the streets are impassable because we don't know which lines are live," said Texarkana resident Nita Fran Hutcheson, who has had no water or electricity at her home since Monday. While the Arkansas state government closed down for the second time in two weeks because of ice, Oklahoma reopened its state offices. Nonetheless, officials warned residents to stay off treacherous roads, where accidents claimed three lives. "Tell everyone to stay out of Oklahoma. We have power outages throughout the state; we have crashes everywhere," state trooper Brett Wallace told Reuters. "The winter storms that have barreled through out state are a threat to life and property," Keating said. A November 2000 vector exists for a massive blackout in New York City and much of the East Coast. Then again, it is possible that blackouts and brownouts may occur sporadically over the course of 2000, culminating in a massive one in November. Should Mohammad Khatami be overthrown by coup or by a foreign invader, the future Islamic state of Iran will be under the control of its fourth successive leader. The biblical prophet Daniel calls this man "the fourth king of Persia" and he will be a warlord. Nostradamus also refers to him as "the Persian," the "chief of Persia," "Blue King Turban," and "the new and dreadful king of Persia." In the year 2000, all eyes in the Moslem world will turn to this leader for guidance or turn away in dread. In November 2000, Iran will test its first nuclear device above ground. The West, already plunged into war, will be angered and terrified at the development because Iran will also have missiles capable of striking Western Europe. OCTOBER 7, 2001 -- U.S., BRITAIN BOMB AFGHANISTAN -- (CNN) -- The United States and Great Britain struck several cities in Afghanistan with bombs and cruise missiles Sunday in response to the September 11 terrorist attacks on New York and Washington. The strikes followed the refusal of Afghanistan's ruling Taliban to turn over suspected terrorist leader Osama bin Laden, President Bush said in a televised address Sunday afternoon. U.S. officials blame bin Laden and his al Qaeda network for the September 11 attacks. "More than two weeks ago, I gave Taliban leaders a series of clear and specific demands: Close terrorist training camps, hand over leaders of the al Qaeda network and return all foreign nationals, including American citizens unjustly detained in our country," Bush said. "None of these demands were met. And now, the Taliban will pay a price." (Full story) The first strikes took place about 9:15 p.m. Sunday as witnesses reported explosions in Afghanistan's capital Kabul and the southern city of Kandahar, the Taliban's spiritual home. 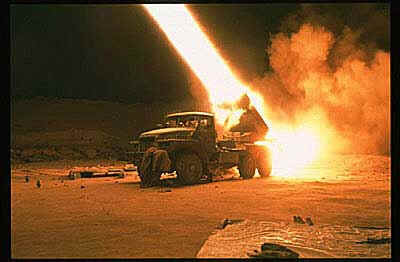 A source in Kandahar told CNN a second and heavier wave of strikes hit the city about an hour later. A senior Taliban official in Kandahar told CNN their command and radar systems at the Kandahar airport was destroyed, but he said the group does not rely entirely on that equipment. Explosions were also reported in Jalalabad, near the Afghanistan-Pakistan border, where al Qaeda has operated training camps. The raids were expected to last well into the early morning hours in Afghanistan. Pentagon officials told CNN the attacks would include strikes by U.S.-based B-2 bombers and B-52 and B-1 bombers flying from the British base at Diego Garcia in the Indian Ocean. "The war against terrorism will be broad, sustained, and we will use every element of American influence and power," Defense Secretary Donald Rumsfeld said. "The aim is to create conditions for sustained anti-terrorist and humanitarian relief efforts in Afghanistan." The Pentagon said it was targeting air defenses, terrorist training camps and other strategic military targets linked to the Taliban. The attacks began with cruise missile strikes launched from U.S. and British ships in the Arabian Sea, including at least one British submarine. U.S. fighter planes from aircraft carriers also were involved, Pentagon sources said. British Prime Minister Tony Blair announced that Britain was participating in the strikes in a televised address from London. "Our determination in acting is total. We will not let up or rest until our objectives are met in full," Blair said. Both Bush and Blair said the attacks would be accompanied by airdrops of humanitarian aid, including food and medicine, to Afghan refugees. Within Afghanistan, a spokesman for the Northern Alliance -- the Taliban's armed opposition -- said it would coordinate its efforts with the U.S. and British strikes. "For example, if major bases which are in front of us, between the front line and Kabul, are destroyed, our forces can utilize the situation for making advance towards Kabul," said Abdullah Abdullah, the alliance's foreign minister. The Taliban ambassador to Pakistan, Abdul Salam Zaeef, told The Associated Press that bin Laden and the Taliban's supreme leader, Mullah Mohammed Omar, survived the initial attacks. Zaeef said the military strikes would "unify the whole Afghan nation against the aggressors." NEW PREDICTION: 11/22/00 -- The date above may say 11/22, but this one's been on my books since September. It should have been posted with the China/Korea prediction above. Since Russia invaded Chechnya a second time it has occurred to me that maybe Russia will invade Afghanistan a second time. We'll see. I'm calling it for December 2000, twenty-one (3 x 7) years after the 1979 invasion. 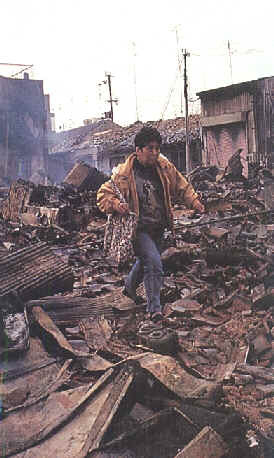 The city of Kabul may be bombarded daily just as Grozny was in 1994-95 and again in 1999-2000. I have also noted that instead of a political crisis in Russia evolving in October, there has instead been a political crisis in the US since November 7. Therefore, I am expanding this prediction to include the possibility that it may instead be the United States that will invade Afghanistan. I can think of no reason why Russia would invade, but the US might over Osama bin Laden. 9 October, 2001, 07:18 GMT 08:18 UK -- (BBC News) - Daylight air raids have been reported in Afghanistan, after a second night of American attacks across the country in the US-led "war on terrorism". Fifteen Tomahawk cruise missiles, as well as long-range bombers and carrier-based fighter bombers, were involved in overnight raids on targets including air defence systems, oil depots and military training camps near the cities of Kabul, Kandahar and Jalalabad. The ruling Taleban said attacks continued after dawn on their main stronghold, Kandahar, marking the first daytime air strike since the bombing began on Sunday. Reports from Kabul say that four Afghans have been killed when a missile hit and destroyed a building run by a UN-funded mine-clearing organisation. The northern cities of Mazar-e-Sharif and Konduz were also reported to have been hit in the strikes, designed to weaken the Taleban and disrupt Osama Bin Laden's al-Qaeda organisation, which the US says was behind , whom the US accuses of organising suicide attacks on New York and Washington on 11 September. Anti-aircraft fire lit up the sky over Kabul, the capital, where electricity was cut and Taleban radio told residents to close the blinds on their windows and remain indoors. The Pentagon said all of its aircraft had returned safely from the raids, which were on a smaller scale than the previous night and did not directly involve British forces, which instead provided logistical support. The US has warned that it may have to launch military strikes on other nations and groups beyond Afghanistan. "We may find that our self-defence requires further actions with respect to other organisations and other states," said the US ambassador to the United Nations, John Negroponte, in a letter to the UN Security Council. The latest air raids came after a senior commander with the anti-Taleban Northern Alliance, Ismail Khan, told the BBC that his forces had entered a key northern Afghan town, Chaghcharan, and were advancing on another, Qaleh-e-Nou. The Americans have shown reporters on board the aircraft carrier USS Enterprise video tape of targets hit in the first raids on Sunday. The BBC's Brian Barron said one showed a missile storage base blowing up in a spectacular explosion, sending a stray warhead careering across the landscape. 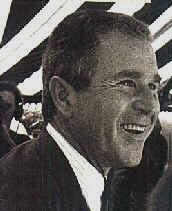 US President George W Bush, speaking before the second round of attacks began, said the opening raids were "executed as planned". His Defence Secretary, Donald Rumsfeld, was more downbeat. "We cannot yet state with certainty that we destroyed the dozens of military command and control and leadership targets we selected," he said. JANUARY 8, 2001 -- UNITED AIRLINES FLIGHT DIVERTED; PASSENGER REMOVED -- FLIGHT ORIGINATED IN CHICAGO -- ANCHORAGE, Alaska (CNN) -- A United Airlines flight bound for Hong Kong was diverted to the airport here because of an unruly passenger, a spokesman for the Federal Aviation Administration said Monday night. Dave Allred, duty office for the FAA, said United Airlines Flight 895, which originated in Chicago, Illinois, landed at Ted Stevens Anchorage International Airport at approximately 8:30 ET. He had no further details. Matt Triaca, a spokesman for United Airlines, said the passenger was taken off the Boeing 747 and in the custody of local police. "All I know is that the passenger was causing a disturbance," Triaca said. "It was enough so that the pilot made a decision to divert the aircraft." Triaca said no one was injured in the incident, and the flight was scheduled to depart Anchorage and continue to Hong Kong Monday night. Adrian Roche, a passenger on that flight, phoned CNN and said that police boarded the plane to talk to the passenger. Roche said he did not see the man during the disturbance, but said flight attendants had described him as belligerent. Roche, who was traveling in business class, said the man was in economy section of the plane, but his shouts could be heard throughout the cabin. "He was screaming and shouting like a caged animal," Roche said. He did not know the cause of the disturbance. NEW PREDICTION: 12/3/00 -- A United Airlines or TWA passenger jet departing from Washington D.C., Chicago, or a southern city such as Miami will crash sometime in December 2000, all passengers aboard killed. It will be one of the worst aviation disasters in US history. Although I suspect it will be an accident, terrorism cannot be ruled out. Unfortunately, if I am correct, I cannot pinpoint it to any specific day. UPDATE (1/9/00): Here it is -- a week late. 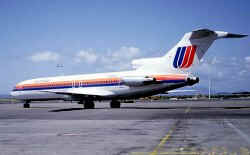 Similar to the incident involving a British Airways jet on December 29. As specified: a United Airlines jet departing from Chicago. It appears this prediction can now be placed in the THWARTED category. Makes me wonder how many other predictions made for the last three months of 2000 will happen in the first three of 2001. JULY 8, 2000 -- NICARAGUANS SLEEP OUTDOORS AS QUAKES CONTINUE -- MASAYA, Nicaragua (AP) -- Residents of this central Nicaraguan province camped on the streets outside their homes Saturday, terrorized by a string of earthquakes that have demolished homes and left at least five dead. Smaller quakes continued Saturday and more are expected in the coming days, said Nicaragua's Institute of Territorial Studies. They follow Thursday's magnitude 5.9 quake, which killed four people, and a magnitude 5.2 temblor that killed a 4-year-old boy Friday. Dozens of earthquakes shook the country on Friday alone, and the largest of them, centered about 30 miles west of the capital, Managua, shattered scores of homes. The boy died in the town of La Ceibita when a wall of his home collapsed. The government reported that about 2,000 people's homes were damaged or destroyed by the nerve-shattering series of temblors. In one of the worst-hit towns, Valle de la Laguna, 79 houses were destroyed and 1,000 others damaged in Thursday's quake, said Lt. Col. Mario Perez Cassar, the head of Nicaragua's civil defense. At least 50 people were injured when the quakes sent tiled roofs raining down on the occupants of mainly stone and adobe houses in the region. Many of the injured were being treated at Masaya's Hilario Sanchez hospital. Some towns were cut off when boulders tumbled down volcanic slopes that surround the Apoyo lake near the quake's epicenter, cutting off roadways. Army helicopters were used to ferry out the injured. In at least a dozen towns and villages, residents afraid to go back into their homes slept on the streets early Saturday even as rain pelted down. Improvised shelters were set up in schools and in tents on public property to house those afraid, or unable, to go home. "We don't dare go back into our restaurant, because we're afraid it could tumble down on top of us," said Dora Tellez, who operates an eatery overlooking the Apoyo lake. On December 23, 1972, a magnitude 6.2 earthquake shook Nicaragua, destroying its capital and killing more than 10,000 people. NEW PREDICTION: 1/17/00 -- When? December 2000. Possibly near the Christmas holidays. It will be a catastrophe. Urban areas hit. Many casualties. 6.8 to 7.8 magnitude. This quake will be a continuation of the seismic rollercoaster begun the previous month in Tibet, Russia, and Japan. UPDATE (7/9/00): Correction: the quake was a 5.9, not a 5.1 as reported by UPI on 7/7. I believe this quake is either a warning that the massive temblor predicted for December in Pacific Central America will strike somewhere in the vicinity of Nicaragua, or this is the one -- .9 lower and five months earlier than anticipated. Whatever the case, caution is urged from now through the remainder of the year as I suspect this region will be especially vulnerable to any super-jolts that will come this autumn. UPDATE (12/3/00): Despite the July Nicaragua quake, Colombia is now added to Nicaragua as a likely focus of a potential major December earthquake. UPDATE (1/13/01): Today's El Salvadore earthquake was a 7.6. 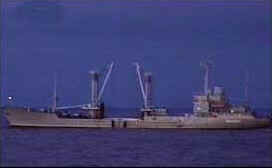 It shook and caused damage and casualties in other nations of Central America as well. The epicentre was on the Pacific coast of El Salvadore. The magnitude falls within the predicted 6.8 to 7.8 range. See the El Salvadore quake prediction for more.